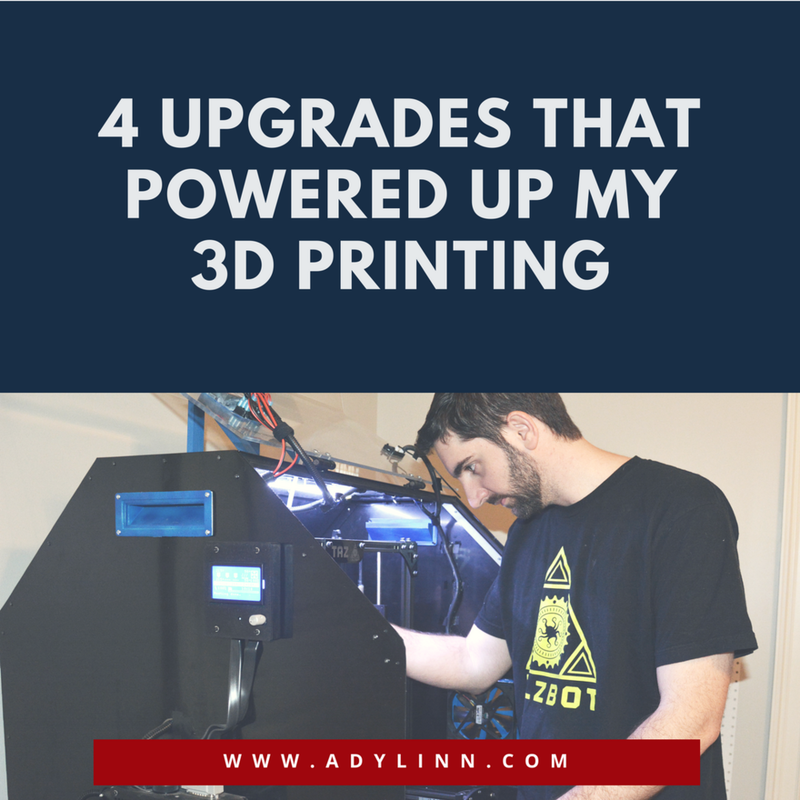 I wanted to share a few of my favorite upgrades I have made over the years and how/why it has improved my experience and quality of my prints. Customizable supports is fantastic and as I’ve mastered 3D printing I have relied more and more on these custom supports. Custom resolution (size), custom placement, infill and dense layer settings all roll up to be extremely useful – especially with the types of designs I create and print. Variable layer settings allow different settings at different points within the print. This is more of an advanced setting but absolutely useful in the situations it makes sense to use. Multiple processes allows me to print several parts at once with all different settings. Because my Taz 5 is so reliable and I know I can let it sit for hours and hours and not have to worry about it, I will load up the bed and print away and this setting allows me the flexibility to print all pieces at the settings I would as if I were printing them individually. These are just a handful of the settings I love about Simplify3D and I recommend this program to anyone that can justify the price tag. CHECK IT OUT HERE. Going from a simple heated glass bed on my Robo R1 and the hassle of the painter’s tape/hair spray I wanted something better. Lulzbot ships their printers with a PEI sheet which is basically a no maintenance print surface and works amazingly well. The only issue I have had with this surface is that over time bubbles form between the glass that causes layer adhesion issues. I solved this by buying a thicker PEI sheet and have not had any more issues and I continue to benefit from the near perfect performance of this surface. At less than $50 this is well worth your time. CHECK IT OUT HERE. I have always been a fan of E3D since I first tried their products and continue to be impressed with the quality, level of support, and overall reliability. I was intrigued by the idea of being able to print flexible material without opting for Lulzbot’s expensive printhead solution and knowing E3D I knew I could expect great results at a much lower cost. I have really had excellent results printing with these 2 upgrades. If you are interested in this and don’t have either, they have a combination package called Aero which combines both into a smaller footprint. I did struggle to get the 2.85mm filament to work with the Titan and ended up going with the 1.75mm version instead and have been very pleased. If you are using 2.85mm and want to stick with that size I would caution you with that and recommend you do a little research before buying. CHECK IT OUT HERE. I knew that I wanted to print in ABS in order to do things like solvent welding (instead of gluing), I liked the option of acetone smoothing and finally, ABS is just an easier material to finish. My issue with the open design of the Taz 5 was terrible bed adhesion, warping, and layer splitting. Adding an enclosure solved all of these issues for me and I’ve been printing with excellent results using ABS ever since! As you can tell the theme here is consistency, reliability, and flexibility. As I’ve become more advanced in my abilities it is now a requirement for me to have the flexibility I want. There are other modifications I would love to make to the Taz to fine tune it but as I’ve learned it’s best not to bite off more than I can chew. Share with me your favorites upgrades/mods you have made to your printer. I’d love to see what has/hasn’t worked for folks.